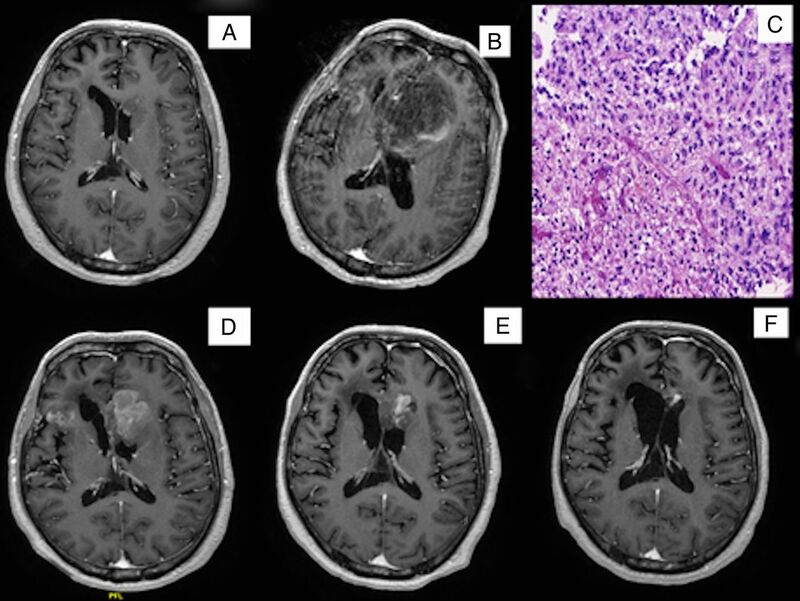 Patients with grade IV astrocytoma or glioblastoma multiforme (GBM) have a median survival of <12 months, increased to 14.6 months by maximal safe resection with radiation and temozolamide. In the absence of chemotherapy, radiotherapy or chemoradiotherapy, spontaneous regression of GBM or regression while only being on dexamethasone (DEX) and levetiracetam (LEV) have seldom been reported. Here, we present a case of a patient who had significant regression of the GBM with DEX and LEV alone. In this study, we hypothesise a plausible antineoplastic role of DEX and or LEV in GBM and highlight molecular, preclinical and clinical studies supporting this role. Patient with GBM has a poor prognosis despite aggressive therapy. This case describes an outlier in the survival curve, doing well currently. A detailed insight into his story offers us plausible explanations for the regression of this tumour. Spontaneous regression of the tumour versus a combined antineoplastic effect of antiepileptic drugs (AEDs) and dexamethasone (DEX) are the leading hypothesis. This case reviews preclinical and retrospective data, which support our hypothesis, and also emphasizes that further clinical studies are a prerequisite for validation and for developing treatment protocols in a tumour with a poor prognosis. A 55-year-old man was admitted on March 2014 for acute-onset lethargy and confusion. His medical history includes biopsy-proven right frontal lobe grade II astrocytoma, diagnosed in April 2000. After undergoing definite radiation, he achieved a long-term remission. In May 2009, MRI of the brain demonstrated a new heterogeneous mass in the right frontal and temporal lobe with minimal mass effect over right anterior horn. As the patient declined surgery, he was empirically treated with oral temozolamide (TMZ) at 150 mg/m2 (days 1–5 and repeated every 28 days) from August 2009 to December 2011. As patient stopped taking TMZ secondary to fatigue, he was kept on observation until January 2013. In January 2013, MRI of the brain (figure 1A) revealed new findings concerning for glioblastoma multiforme (GBM). Patient declined surgery again and was lost to follow-up until March 2014, when he presented with this acute clinical presentation. (A) MRI brain T1 with contrast demonstrating features concerning for GBM. (B) MRI brain T1 with contrast demonstrating a large bi-frontal solid expansive mass with vasogenic oedema. (C) H&E staining of frontal lobe mass from (B) showing WHO grade IV astrocytoma. (D and E) MRI brain T1 with contrast at days 57 and 99 demonstrating a decrease in size of frontal and parasagittal mass. (F) MRI brain T1 day 810 reveals further improvement in the lesions. GBM, glioblastoma multiforme. MRI of the brain revealed a large bi-frontal solid expansive mass with vasogenic oedema (figure 1B). Patient was immediately started on intravenous DEX (4 mg intravenously every 6 hours for 7 days followed by oral dosing of 4 mg two times per day) and levetiracetam (LEV) 500 mg orally two times per day for seizure prophylaxis. Brain biopsy revealed anaplastic fibrillar astrocytes with high mitosis and infiltrating into the adjacent brain parenchyma with associated satellitosis and with large areas of necrosis. Patient was diagnosed with WHO grade IV astrocytoma or GBM (figure 1C). Over the next 2-month period, patient's cognition gradually improved with resolution of delirium and speech problems, while he remained on oral DEX and LEV. Brain MRI on day 57 revealed mild improvement (figure 1D). On day 99, brain MRI showed further reduction of frontal, parasagittal mass size (figure 1E). On day 120, he was started on concurrent TMZ and radiation followed by the maintenance of TMZ. At the time of writing this manuscript, patient continues to do well with brain MRI showing no signs of recurrence (figure 1F). GBM is the most aggressive and lethal primary brain tumour and carries a dismal prognosis.1 ,2 Maximal safe resection followed by adjuvant concurrent chemoradiotherapy with oral TMZ remains the treatment of choice.3 While rare cases of long-term survival with GBM have been described,4 spontaneous regression in GBM setting has never been published. Continuous regression of GBM was noted in our patient while on DEX and LEV, without any cancer-targeted therapy, suggesting that the response may be secondary to DEX and/or LEV. On the other hand, Bobustuc et al22 demonstrated that LEV increased histone deacetylase 1 (HDAC1) transcription and recruited HDAC1/mSin3A compressor complex to the p53-binding site in the O6 methylguanine-DNA methyltransferase (MGMT) promoter, consequently silencing MGMT and enhancing the anticancer effects of TMZ. In a single institutional retrospective study, Kim et al23 noticed that the median progression-free survival (PFS) and OS for patients who received LEV in combination with TMZ was significantly prolonged compared to those who did not receive LEV (PFS 9.4 vs 6.7 months, p=0.010; OS 25.7 vs 16.7 months, p=0.027). Tumour molecular profiling using Caris Life Sciences (Phoenix, Arizona, USA) revealed a deficiency of the DNA repair system at multiple levels (table 1): BRCA1/2 mutation, along with MGMT gene silencing by methylation. isocitrate dehydrogenase 1 (IDH1) mutation and 1p/19q codeletion, known for their correlation with improved sensitivity to chemotherapy and other genotoxic stress, were present. It is possible that the impaired DNA repair system has conferred an improved sensitivity to DEX and LEV. This observation needs to be proven through cell lines model harbouring defect at different levels in their DNA repair system and from large clinical database. Although DEX and LEV's role in GBM regression is supported by few preclinical and retrospective clinical data, randomised clinical trials are still lacking. Further efforts are needed to define the antineoplastic role of DEX and LEV in GBM. Secondary glioblastoma multiforme (GBM) progress from astrocytoma and have a better prognosis than primary GBM. Patients with tumours having O6 methylguanine-DNA methyltransferase promoter methylation respond better to alkylating agents such as temozolamide, translating to longer survival. Dexamethasone and levetiracetam have been shown in in vitro studies and retrospective studies to play a role in directly inhibiting tumour proliferation and increasing sensitivity to chemotherapy.
. Use of dexamethasone in the treatment of cerebral edema resulting from brain tumors and brain surgery. Am Pract Dig Treat 1961;12:169–74.
. Mechanism of dexamethasone suppression of brain tumor-associated vascular permeability in rats. Involvement of the glucocorticoid receptor and vascular permeability factor. J Clin Invest 1996;98:1400–8. Contributors PP and NEA conceived and designed the manuscript, and also drafted the manuscript.